There are still 32 days left to go in the crowdfunding and the prize monty has almost hit $21 million. Valve's DOTA 2 The International tournament raised a record $20.77 million in prize money last year. That record lasted less than a year, as this year's The Invitational 2017 has already raked in $20.79 million, and there are still 32 days left to collect more. It has also set a record for the most lucrative tournament in esports history. The tournament, which started in 2011 with a prize pool of only $1 million, usually starts with Valve seeding the pool with an initial $1.6 million. The pool then gains more funds through players buying a Battle Pass, and 25% of each pass is dumped into the pool. Passes start at $9.99 for a level 1 pass, but you can jump start to level 75 for $36.99. From there you can buy additional levels - five for $2.49, 11 for $4.99, and 24 for $9.99. If you are unfamiliar with how the system works, Valve reveals various perks at set intervals for players based on the level of their Battle Pass. When different bundles are revealed, the pool traditionally jumps as players add levels to their pass to get the extra perks. As of this writing, players can get perks with a Battle Pass as high as level 2,225 right now, and Valve still plans on releasing more perks, including a third Immortal Treasure sometime before leveling ends. 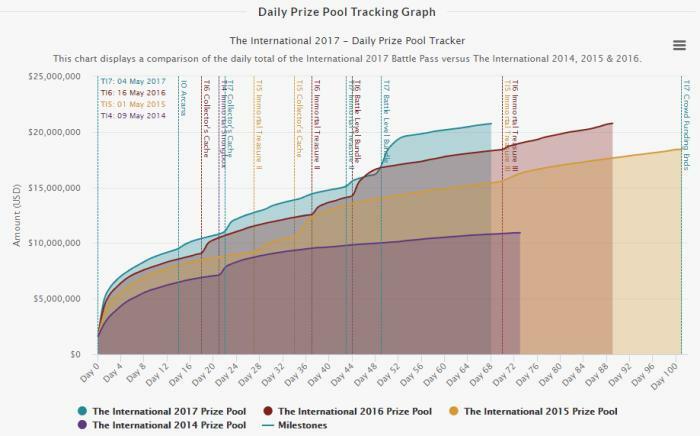 According to the DOTA 2 prize tracker, run by Team Secret manager Matthew "Cyborgmatt" Bailey, the pool topped last year's record 20 days earlier than when the 2016 pool set its then record. The biggest spike so far came when a Battle Level bundle was announced around Day 50. The International 2017 will run from August 7 through August 12 and again be held at the KeyArena in Seattle. Six teams had direct invites, while another 12 came in via qualifiers for the Americas, Southeast Asia, Europe and China. This will be the first year of 18 teams, up from the previous 16. The event will again be streamed live on Twitch.